As you saw yesterday, we were all over London. We were incredibly busy. And our cameras were constantly clicking, so I've got tons and tons of pictures to share. So as not to overload everyone, I'm going to spread my recap posts over a few days and I thought I would start with the classic London sights. The first thing we did was take a ride on the London Eye. Now maybe that isn't truly classic London, but it did work out well for our schedule (we arrived in London from San Diego mid-afternoon, headed to our rental flat and had about enough time - and energy - to head to the Eye, take a ride, eat some dinner and collapse). Because of the orange and blue lighting, this is what your night pictures inside the Eye will look like. Well, you probably won't have The Mr talking to his dad. But you get the idea. The Houses of Parliament and Big Ben's tower. Because it is the bell that is named Big Ben. You don't need to remember that though. They'll tell you. I suspect we (tourists) get that wrong a lot. I like this view of Big Ben (the bell I mean of course)... from beneath. To get this, however, you must stand in the street. They have actually blocked off part of the street. I suspect because so many of us (tourists) stand in the street trying to capture this view. One of the most iconic sights in London is St. Paul's Cathedral. Inside and out, an incredibly gorgeous building. 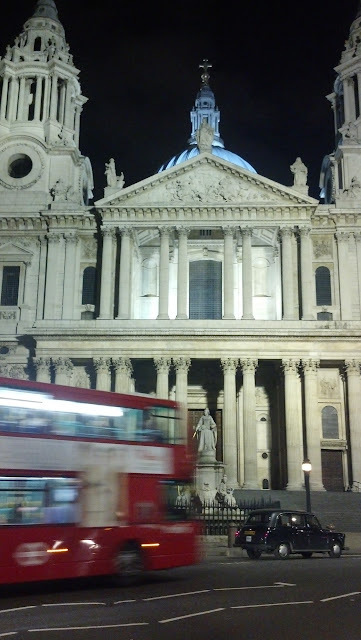 And this night shot of St. Paul's includes a couple of other London icons - the black taxi cab and the red bus! Something else most people recognize is the Tower Bridge. This isn't (as I suspect many tourists must ask a lot) the London Bridge (we were told this fairly often as well). This is taken from inside the Tower of London, and in the foreground of the picture you can see remnants of the old Roman wall. From when Romans ran London. And pretty much everywhere else. This is taken from the other side of the Thames. London's South Bank, a trendy area, with lots of art and food and activity. And of course, the changing of the guard. This is at Windsor Castle, and was very impressive. Part of the changing of the guard ceremony includes the band playing. They were very good and played two songs for us. One of them was "Singing in the Rain" and Michael Buble's "Still Haven't Met You Yet"! The Queen's guard has a sense of style and fun. Looking at these pictures makes me want to go back. Tomorrow I'll share some familiar sights from a slightly different perspective. Hope you are enjoying - if you've got any particular place that you'd like to see more of, let me know and I'll share if I can! My favorite city in the whole world. And you went to many of my favorite spots--the tower, St. Paul's. Did you hit the British National Museum?